Love collecting DVD’s, hanging at home with my family and watching Cubs games. Cubs fan. Comedian, Writer, Actor, Producer, Computer owner, Blog enthusiast. Looking forward to talking Cubs with everyone throughout the Winter Meetings/offseason, through Spring Training and all of 2012! Ah One, Ah Two, Ah Three…GO CUBS GO! I live in New York City (I’m in Chicago a lot now so meeting Cubs fans has become much easier) and there aren’t many Cubs fans that I’ve met here so far who are readily available to talk about the day’s Cub headlines or the most recent Cubs game. It’s great to have access to a community of baseball fans in general, but especially to be able to reach out and communicate with other Cubs fans on a daily basis. Until the Cubs hire me as a beat reporter/analyst, this is the closest I’ll come to either…and I love it! My favorite post would probably be the one titled “The Face, The Brace, The Pace, The Place and The Ace” or “The Poster Child”. The first one was one of those blogs where you feel like you have so much to say it just flows once you sit down and start typing. Those are exciting when they happen. The other one I just think is really funny…my own little parody of the Cubs upcoming ads for the 2008 team. Good times. (I know there are a handful of others I’d list here…maybe I’ll include in the sidebar soon…links to them). The first time I received a comment because I couldn’t believe people were actually reading my blog. It’s made me post nearly daily lately with people responding and the feedback I’ve received regarding how many people are enjoying my page. (This still holds true). There are couple that I was really enjoying yet can’t seem to find any longer which is too bad. 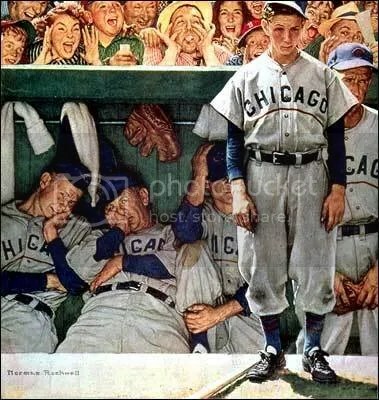 I really like Crawly’s Cubs (no longer active) and Some Ballyard. A good mix of humor and analyst is what I really enjoy when reading someone else’s blog. And anyone who enjoys my blog…I generally read there’s regularly too. Blu-ray? I don’t know you got me. (Turns out, it was headed to WordPress). …champagne all over your team’s clubhouse at the end of the World Series. I’d say that’s happiness indeed. (Indeed).